I just got an email from Barnes & Noble. 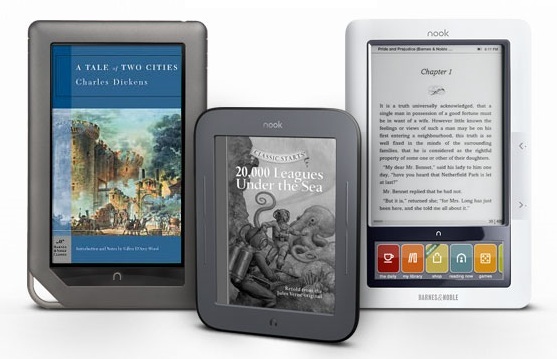 They're running their free classics promotion again, and this time B&N Members can get 100 free public domain titles if you buy a Nook. Last time they had a promotion like this I ridiculed B&N for giving away books they didn't own. TBF, that's nnot what they're doing. I have a couple of B&N's pd titles on my various Nook apps, and I looked them over before posting. The ebooks that they give away are not your ordinary grab-from-Gutenberg ebooks. They've been enhanced with endnotes, footnotes, introductions, and related readings. The problem here is that B&N keep failing to convey the value they've added to these titles. Even when they did mention it in the press release, the details were buried near the end. Few read that far into a press release; I don't because I have trouble controlling the urge to vomit (after you read your 40th or so press release you'll understand how I feel). Anyway, i think you should try one of the B&N freebies before you disregard them. B&N should start coming up with their own ideas. I was just thinking the same thing. Kobo did the 100 free books AND branded themselves the David vs. Goliath (which Kobo did beforehand). B&N clearly has no originality. Kudos to B&N for producing good quality books. It’s not just the additional content, it is also the spelling and the typography (where project Gutenberg is far less than stellar). And by the way, shame on Kobo which takes Gutenberg epubs and *adds* DRM to them. Also, people find that they don’t want to plow through 100 books to get to the books they themselves choose. There’s an organization problem. And now with the Nook, they should ‘Shelve’ those to keep things clean as possible because the Nook Touch has a screen, half of which is taken up with *ads* — the bottom has recommendations for what you should read. And then you get pictures of a couple of book covers you might want to see, out of however many you have. But once you choose another menu option, depending on where you touch the screen, you’ll see ways to list them in about 3 sorting orders, which will help. But the first thing I’d do is back the 100 gifted classics to my pc and get them out of the way of my reading on the e-reader. The books that Kobo has are gutenberg books not the same as Barnes and Noble Classic series. B&N gave away their classics (about five a week) when they sold the first nook. I have about 20 of them, and they are very nice with time lines, author into/bio, notes, etc. They are well worth having. People tend to forget that Barnes & Noble is also a *publisher*. Their classics are actually *published*, not just reformatted from other sources. They put quality formatting and additional content into them.